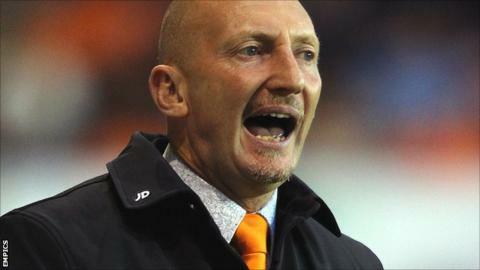 Ian Holloway says it is important to manage his growing Blackpool squad correctly for the rest of the season. And that could result in allowing some players to leave the club on loan. "With the new faces coming in, if I've got to loan some out, like I did with Matt Phillips last year, I might do it," he told BBC Radio Lancashire. "I've got to keep them all playing. Hopefully we'll learn how to be a slightly bigger and stronger unit, like our opponents have been for years." Young winger Phillips impressed in a loan spell at Bramall Lane and became a first-team regular on his return to Blackpool, playing a key role in their run to the play-off final. The Seasiders have made a flying start to the Championship season and lie second after a 4-1 home win against Middlesbrough on Tuesday. Holloway made six changes to his team from the weekend draw at Barnsley, including handing a first start to deadline day signing Nathan Delfouneso. And the manager's decision to rotate his starting line-up paid dividends, with the on-loan Aston Villa striker netting twice at Bloomfield Road. Holloway continued: "I don't want stars, I want all good players. "I want them all to share the responsibility of playing in front of our fans, home and away, and trying to do as good as some of the heroes they had 40 years ago. "They're certainly making me feel proud at the moment."